So with this being my last chance to blog in 2008 I'm going to write here my NY resolutions. When the clock strikes midnight I will be up in the air operating a Scarebus back from London Gatwick. I don't really have plans, the mates I do have in London town can't be arsed trekking to the hotel to see me, and on New Years Eve I'm not even going to risk leaving the vicinity for fear of being stuck in traffic, or at a tube station in the city. Gonna do my Marks and Spencer run and that's it methinks. Shop for a property. I have the money for a decent mortgage, and I guess with the financial crisis making it difficult to get one at the moment, all I can do at the moment is to sit tight, and save, and buy when things start moving up again. Also keeping an eye on things at home. Go one year without a sick day or absent at work. I would like to get SFS before I leave the company, and ever since I got my First Class upgrade things haven't been going too well between me and my manager. Write more blog posts. It's getting harder to be honest, because most destinations I fly to I've been already, and I've no desire to go sightseeing again. But all sorts of things happen in-flight, and you guys are usually the first to hear about the day's dramas. GET MY DRIVERS LICENSE! This is a must-do for 2009, more so than the other resolutions combined. The first and only time I went for my test was in 2001, and a roundabout ended up worse for wear as a result, but it's been 8 years now and I've been putting it off for long enough. No more excuses. One of the biggest sacrifices you make when you take on a job like this is having to work when the rest of the world is on holiday. Christmas Day, NYE, Easter, Eid, Queen's Birthdays, Kings Birthdays etc, we work them all. And don't even mention penalty rates here in DXB - Christmas Day is simply another day in the calendar, and we work them like every other airline does. I missed my first Xmas in 2005 - I had only just gotten the job and was in training college, but it wasn't so bad as you were with your batchmates, plus I already had an early Xmas dinner with the family and the (then) boyfriend's family before leaving Perth. 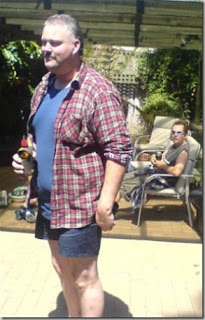 2006 was fantastic, scheduling gave me 5 days off - 22-26th December, booked firm flights home and had an absolute ball. Mum even made it home which made things even more special considering how chaotic and emotional things were at the time. 2007 was the worst. I had the same days off, 22-26th. But couldn't book a flight anywhere. The best I could do was full-fare Business Class to go there, and a firm ticket coming back. My bank balance couldn't afford it, so I stayed home, and managed to swap onto a flight home on the 27th. But on Christmas Day I caught a very nasty cold, spent it in bed sweating and shaking, and was greeted with a phone call from Dad. As much as I love him the last thing I wanted to hear was what sort of roasts were in the Webber and who's cousin's kids got what for Christmas. I didn't really want to know what I was missing out on. 2008 is looking to be in the same spirit as last year unfortunately. My closest mates are either on layovers or leave, so it will be a very quiet day here in the Towers. I tried in vain to swap onto a nice layover, and despite getting onto a Dusseldorf, problems with my residence visa warranted removal from the roster until the 26th which was disappointing. Will probably spend the day at Dubai Mall having a spell at the Ice Rink (with a bit of luck it'll be empty) and then a massive ironing session to ready myself for the Milan flight I have coming up. Am hoping that a skate will break me out of this Bah Humbug mood I'm in at the moment. If you do find yourself in a plane during these holidays, please spare a thought for the hostie pouring your 4th Jack Daniels and Coke for the hour. Yes we do travel and see places and get to live in a 'glamourous' city. But we give up many home comforts to do so. We give up special holidays with the family, birthdays, boozy arvos on the foreshore on Australia Day watching the Skyworks, and so on. Some of the crew even have kids back in their home country they support with this job, going for months without being able to operate or pax a flight home to see them. Go gentle on us, please. Well this month I was supposed to do a promotional event in Santiago, Chile, which I was getting pretty revved up about. There were 16 of us girls going and it was for another soccer event, similar to the one in Korea I did about a year ago - very easy, 5 days or so in Chile with about 8 hours of total actual work. Some girls working the event were also from other promotions I had done in the past, one in particular was a friend of my former flatmate Ash (aka. the klepto) who is always a great laugh. So with my roster released, planned, swaps sent out and everything, I was really surprised that only 7 days before we were scheduled to leave they cancelled the event. Well they didn't really cancel the event, but they cancelled the trip for us. As a result, the 3-9th on my roster was assigned Can Use (CU), which they usually assign to someone if they're called sick for a long flight, or if they're absent, or call sick during a period of low crew turnout, such as Xmas or NYE, then you get punished with CU, which is essentially additional reserve duty. This is a pain, because you can't swap flights during this period, and with leave coming up I needed some serious hours. Up until today my CU was awful - one standby duty I didn't get called out for, and 4 days spent in DXB doing pretty much nothing, most of my mates either on leave or on long sectors with 9 days away from base. So on the 8th, which was Eid, I was almost guaranteed to get pulled out. Was assigned Airport Standby, and it was the busiest I had ever seen the standby lounge - there were 2 briefing staff along with the usual standby lounge coordinator busy trying to crew as many flights as they could because so many crew had called sick. I only waited 30 minutes before I was told I was headed for Houston. 31.5 credit hours! I can actually afford to eat next month. The flight to Houston was alright - we only had 2 passengers up the front, one of which was a Captain headed to Mexico, so it was very little work. We had a lot of rest in the bunks which is great to break the trip up, but due to being on standby I didn't pack my pyjamas, so was basically in my underwear and a blanket , and made sure to keep the curtains secure and one eye open just in case one of the male crew got lonely and wanted a kick in the groin. Arrived at the hotel and was so tired I ended up sleeping in my uniform with a make up remover wipe in my hand. Looking back I only had 1 hr before the standby duty, and 2 hours in the bunks of actual sleep, so for a 16hr flight this was understandable. Was pretty good in Houston, went to the gym every morning and tried to eat healthy food (Note - tried to, outside of the hotel there were McDonald's, KFC, Popeye's, Pubs galore, and plenty of coffee houses, the rumours of finding it hard to get a salad in Texas were very true) I ended up going to Galleria Shopping Centre to get some hand sanitiser from Bath and Body works. They had them in 5-6 different flavours, which considering the amount a Flight Attendant normally goes though is such a luxury. Houston used to be a 24hr layover, but about a month or 2 ago they changed the legality of the trip and it's now 48hrs layover. having just done the trip, there is absolutely no way I could be fully rested for the flight back. And the flight back was a killer. The hotel, in their infinite wisdom, programmed the wrong wake up call, so instead of a wake up call at 3pm on the 10th, we had our call at 3am! Not a single crew member was able to sleep afterwards, so most of us were already pretty cranky at check out, and an apology (albeit very sincere) on checkout. No phone call after the wake up call to apologise, or to say they made a mistake, resulting in one crew member going down the lobby in full uniform 12hrs before pick up. When we left the bus at the airport to go to check in, it started snowing for the first time since Xmas Eve 2004. Which meant a 20 minute delay on push back to de-ice the aircraft. We checked in, went through security, briefed, and then boarded passengers. So we waited a while for the de-icing fluid. And waited. And waited. For 3 hours past the departure time. On ground with a plane full of now-irate passengers. As it turns out, Continental Airlines had priority over the de-icing fluid, and the machines used to de-ice/anti-ice were only for narrow-bodied aircraft, so by the time one wing had finished de-icing, then finished with the second wing, the first wing would have snow on it again. The decision was made to postpone the flight, passengers given snacks upon disembarking (good hearty food like Lay's crisps, Pepsi and Cereal breakfast bars) and we were on our way back to the hotel. We were given 10 hours rest between check-in and check out, absolute minimum rest. I bolted to my room, waited an hour before housekeeping had a power adaptor for me, then proceeded to change my flights as best i could to Perth, as I was going on leave straight after I was arriving back from Houston. Due to the delay I had missed a non-refundable/non-endorsable ticket, but 5 hours later messing with a slow internet connection managed to list myself on a standby flight. As it turns out, I was lucky enough to even get a bed for second stay - the hotel was operating at capacity. Some crew entered their rooms, saw the coffee table, couch set, dining table, chairs, and thought that they had scored the suite. Looked around some more, they realised they didn't have a bed to sleep in! The couch was actually a sofa bed, and those crew were told they could sleep in those. I didn't realise until we checked out for the second time how badly we had been screwed over by this hotel - first the wake up call, now this! Unbelievable. So now, having left Texas, and working the washing machine and dryer to their limits back in Dubai, I'm now in Perth on leave. I've travelled 13 timezones in 2 days, and whilst I don't really suffer from jet lag that often, I really feel it at the moment. Passed out on the couch at home for 8 hours, then slept on the bed for 3, so hopefully my sleep patterns are somewhat normal again. Considering how much of a kerfuffle the Houston trip was I will definately need a week of Dad's roasts to recover from the ordeal. So I guess branching out a little from my previous post on my standby suitcase is the roll-aboard. Only if I showed you guys the FA cabin bag it would be pretty standard - manuals, tabard, gloves, non-recyclable glossy onboard updates we have to keep for 3 months at a time. So considering the insane amount of paxing I do, I thought that I would share with you guys what I carry on board with me, some items which are an absolute must for the 11hr flight to/from Perth. 1. The PamBee. I got this in New York for about $60 but it's gone up since then which is a shame. I go mental if I travel in economy and don't have this with me. I don't mind using the on-board blankets and stuff when I'm on break and operating the flight, but find after a long period of usage there's a lot of static build up, or sometimes when outstations wash yak-soiled blankets with regular ones there's a horrible smell that lingers. This is, by far, the best thing I have purchased for frequent travel since getting this job. 2. 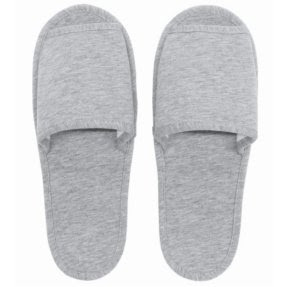 MUJI jersey travel slippers. More comfy than wearing socks, and more hygienic, especially for toilet trips. 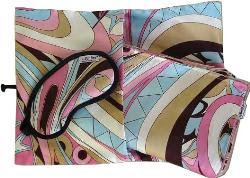 Takes up very little room, has it's own pouch and is completely washable! 3. 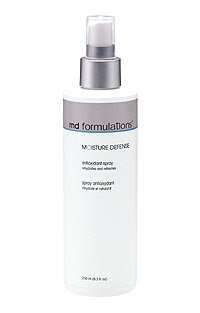 MD Formulations Moisture Defense Antioxidant Spray. The air inside the cabin is very dehydrating, and this stuff works wonders. Expensive in Australia and difficult to find in Dubai, I get mine from Ebay for half the price. Of course when I do travel it's in a 70ml spray bottle suitable for any LAGS bag. 4. 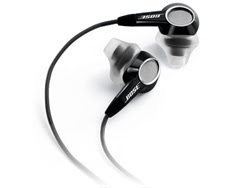 BOSE In Ear Headphones. I originally bought these to replace my broken iPod headphones, but find that I can sleep with these on more comfortably. Used either with my iPod touch or on the aircraft, I find the on-board headphones tend to be quite painful to lean on, especially if you have freakishly small ears like I do. 5. My Laptop or iPod touch. So I can surf the net whilst waiting for my flight to board. 1. Buy Duty Free. 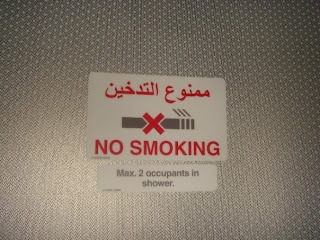 Unless I cannot get the same product at DXB arrivals (i.e. Iranian Caviar for example) then it's not worth the lugging around from security check, to plane, to quarantine etc. 2. Dress down. If the flight is overbooked there tends to be upgrades. Walk up to the check in counter looking like this and you will have no chance of being one of the lucky few. Though I have from experience flown people decked out in flannelette and VB tank tops on flights from Auckland in Business Class and believe this to be the only exception, or a gross mistake on Check-In's part. I'm more inclined to go with the latter. 3. Pack the cabin bag to weigh more than 10kg. I guess with a laptop it's pretty difficult, but considering nowadays flying out of Perth they weigh your cabin bag and force you to check it in if it is over the limit, if I can do without it on board it belongs in the suitcase.